Basement Mold Removal in PA – Professional, Guaranteed. Basements are one of the most common hot-spots for mold development in Eastern PA. Basements are notoriously damp and have poor air circulation, not to mention they present a high risk of water seepage through your foundation walls. Once mold takes hold in your basement, it can spread quickly due to conducive conditions. If you detect signs of mold development in your basement, call now. Help is just a phone call away. Mastertech’s basement mold removal professionals can identify if your basement has a mold problem and develop a safe and effective basement mold removal solution for your Eastern PA home or business. Once your basement is clean and safe, we’ll make recommendations for preventing mold recurrence. Mold can potentially be making you and your family sick. Mold effects each person differently. Mold symptoms range from mild allergic reactions to severe upper respiratory problems. It all depends on the individual, the species of mold, the length of exposure, and several other factors. In addition to potential health risks, living in a home with mold is simply unsafe due to the underlying water problems. Mold and water damage can eat away at your building materials and seriously compromise the structural integrity of your home. That is why an attic mold removal plan will ALWAYS include moisture control tactics to prevent future problems. Visual Assessment– Your Mastertech Inspector will complete a comprehensive visual analysis to determine any conditions that could stimulate mold growth in your basement. We will provide you thorough digital documentation for your records. Moisture Mapping– Your inspector will carefully map out the damp or wet areas of your basement to determine where water or moisture could be getting in. Report of Findings– After completing a basement mold inspection in Eastern PA, your inspector will compile a clear and concise report that outlines all his/her findings. If deemed necessary, your inspector will present you with a detailed scope of work for a safe and effective basement mold removal in Eastern Pennsylvania. The basement mold removal professionals at Mastertech of Eastern PA will specifically develop the most efficient and safe Eastern Pennsylvania basement mold removal scope of work to ensure the most thorough and successful clean up of your property. Each Mastertech mold removal is backed by a 5-year, mold-free warranty. 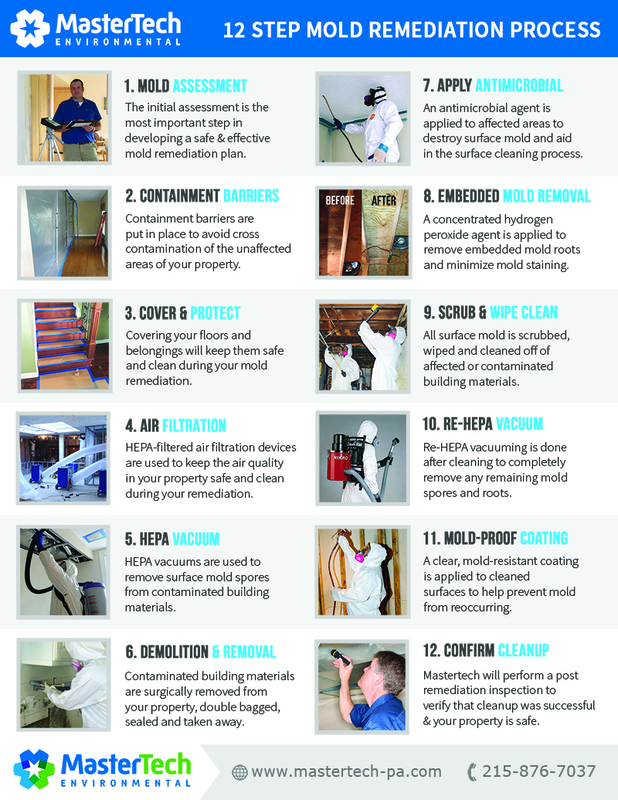 Call 1 (215) 876-7037 today for your Basement Mold Removal Estimate. We will be happy to answer all your questions and schedule you for an appointment with one of our professional mold inspectors.